Tumours and other diseases are often studied by slicing off thin sections of tissue and examining them under a microscope. But when it comes to understanding the brain, 2D sections are of little use. Brain cells are long, and tissue sections can chop right through them. This means that sectioning tells us little about the complex way neurons connect together, which is all-important information when studying conditions like dementia. Now, scientists at the Acute Brain Injury Research Group at LMU Munich have found a way to image the whole brain in 3D - by making it transparent. The technique uses alcohol and other solvents to get rid of water and fat molecules that scatter light and prevent it from penetrating into the tissues. Once these are removed, the brain becomes see-through, and can be scanned in a microscope to build up a 3D picture of its hidden network of neurons. To image the brain, the team labels certain cells with glowing proteins so that they can be spotted more easily. A real breakthrough of the latest work, published in Nature Methods, was finding solvents that are compatible with the fluorescent markers. As well as making them see-through, the procedure shrinks tissues so that large specimens are easier to image under the microscope. 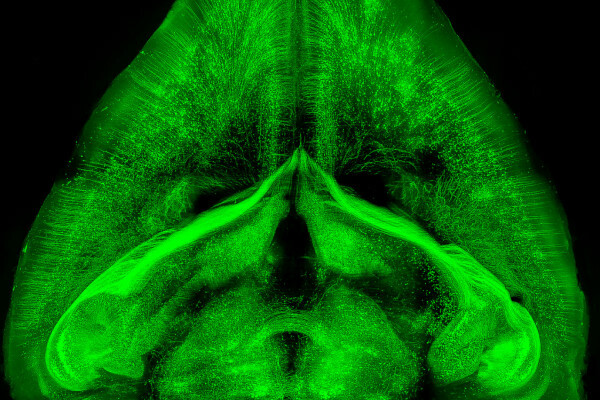 To demonstrate this, the team made not only the brain, but the entire body of a rat transparent. "This is the first time that has been achieved - making a whole rat transparent," says Ali Ertuerk, who is heading up the research. "I think this just shows that the technique is really important". While his method cannot be used on living animals, by making a database of images available to other researchers, Ali hopes that it will reduce the number of rats and mice that are used in research. He is also confident that the technique could be used to make a human brain transparent. "Of course the issue there will be how we are going to label the structures... we don't have the solution yet, to label the human brain" Ali explains. By mapping individual neurons, Ali's team hopes to study brain degeneration, and how injuries in one part of the brain can disrupt whole networks of neurons. "Now it's more and more clear that... traumatic brain injury affects not only the lesion site, but the rest of the brain... Neuronal networks, like cables, are all connected with each other - we're interested in really seeing the bigger picture. " The applications are not limited to studying just the brain: scientists also hope the technique will shed light on how tumours can spread from one organ to another, and how conditions like diabetes and stroke can impact seemingly unconnected parts of the body. How does the brain respond to audiobooks?